*Every haircut is finished up with a hot lather shave around the ears and neck and a invigorating, yet soothing shoulder massage. The Arizona Gentleman’s Barber Shop was established in 1997 in Sun City, Arizona by Gary Grewe, owner and Master Barber. 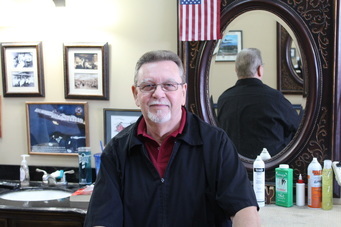 After relocating from Michigan, Gary brought his barbering skills to Sun City and quickly began building the business by offering quality barbering services. Gary’s standard for high quality work resulted in bringing onboard the finest barbers creating a barber shop with consistent and excellent service. The Arizona Gentleman’s Barber Shop relocated to it’s present location in the Promenade Shopping Center in the southwest corner of Bell Road and 99th Avenue in 2009 and continues to welcome new customers and loyal repeat customers who enjoy the finest barber services in the area. Gary Grewe, owner is originally from Detroit Michigan and began his barbering career in 1978. He and his wife moved to Arizona to raise their young family and start a business. Gary is a huge college football fan and enjoys music, reading, hiking and american history. Bill is from Wilmington Illinois, and moved to Arizona 39 years ago. He is the father of four and has been married to Lisa, his loving wife of 17 years. He began working as a barber, alongside his father, Bill Van Duyne Sr., and has been a barber for 24 years. Bill is a big cubs fan as well as all Chicago teams. His hobbies include reading, movies and watching the kids play sports. He also has an associate of applied sciences. Bill has been at the shop 11 years. Terry is originally from Warren, Michigan. Terry began his barber career in 1965! He has been with AZ Gents for 4 years. He enjoys sports, golfs frequently and resides in Sun City. Terry has an extensive background cutting mens hair & is an enormous asset to the shop! Don is from Wickliffe, Ohio and started cutting hair in 1969! Later he relocated and cut hair in Broward County Florida’s #1 barber shop. Don has worked in the shop since 2001 and resides in Sun City.